French army tanks and armoured vehicles crossed into Mali from Ivory Coast. A column of about 30 French army tanks and several troop carriers, accompanied by a helicopter, crossed into Mali from Ivory Coast in an international mission to take control of the African nation’s north from Islamist extremists, French media reported Monday night, January 14, 2013. French soldiers sit in a Malian military vehicle at the 101 military air base near Bamako,the capital. 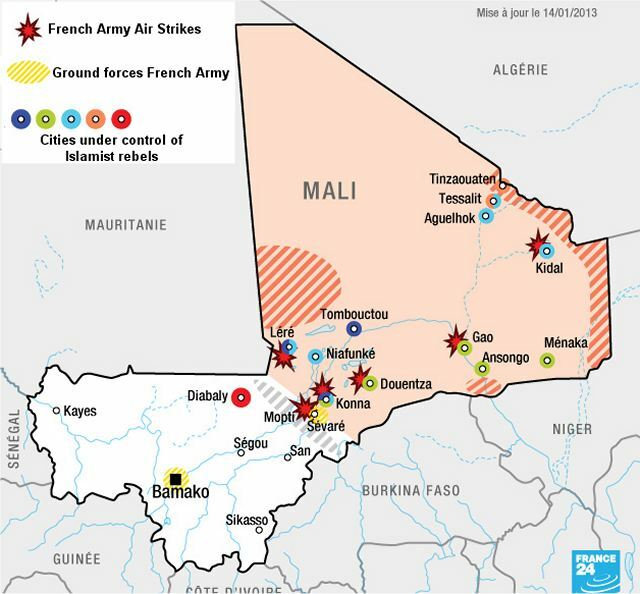 France is using air and ground power in a joint offensive with Malian soldiers targeting Islamist militants controlling northern Mali. About 550 French troops were in Mali on an operation that the Defense Ministry said it expects to last “several weeks.” France has 6,000 citizens in Mali and is advising them to leave, but has not organized an evacuation. Tanks had set off from Abidjan and are part of Operation Licorne, the French military force deployed in Ivory Coast since September 2002.